I am kicking myself for not attempting turnovers before. They were one of the easiest treats I’ve made in a long time! No joke. Just cut the dough, spoon in some filling, bake, and glaze. And then bite into a little flaky piece of absolute deliciousness. 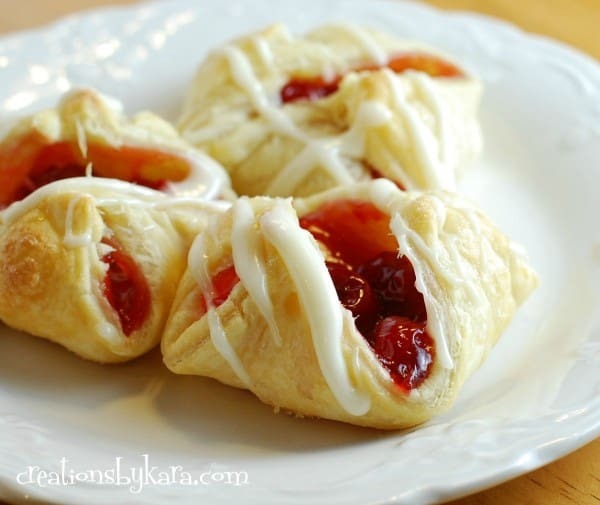 I used a cream cheese glaze on my turnovers, and it made them over the top yummy. Better than any pastry I’ve had from a bakery. And I whipped them up in minutes. That my friends is the sign of a successful recipe! I hope you’ll give these turnovers a try. Don’t be scared. You can do it! 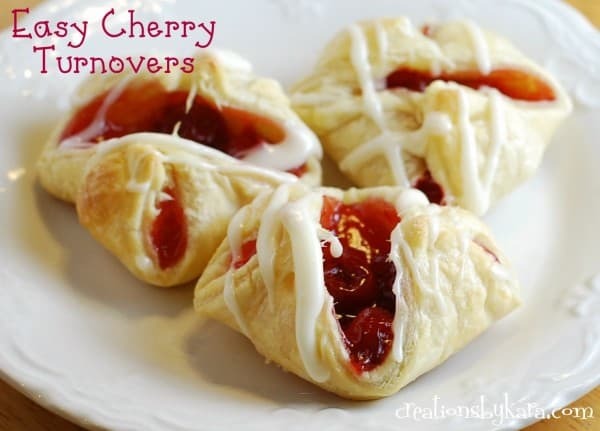 Super simple cherry turnovers made with cherry pie filling and topped with cream cheese glaze. Turnovers: Unfold one of the squares of puff pastry dough. Cut down the fold lines to make three strips. (I used a pizza cutter.) Then cut each strip into thirds. You should have nine squares total. Line a cookie sheet with parchment paper. Place on square of dough on the parchment, and spoon about a tablespoon of pie filling in the middle Pull up the corners of the dough and pinch together at the top. It's OK if the filling is still showing on the sides. Repeat for the remaining squares. Brush the tops of the pastries with milk, then sprinkle with sugar. Bake in a preheated 375° oven for 15-20 minutes, or till golden brown. Repeat the process for the second sheet of puff pastry. After the turnovers have cooled slightly, drizzle them with cream cheese glaze. Enjoy! Glaze: Beat cream cheese and butter till smooth. Beat in powdered sugar and vanilla. Add milk to achieve a drizzle-able consistency. 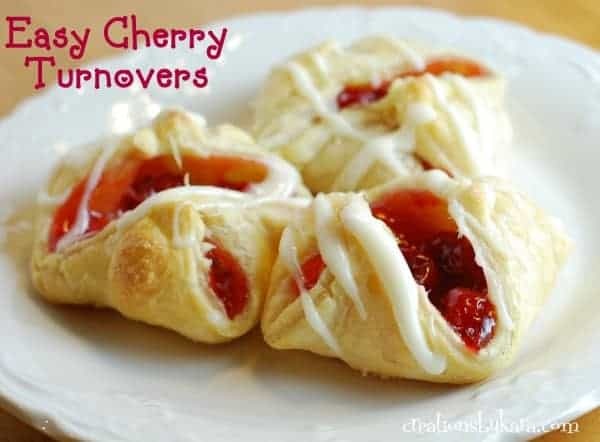 Drizzle over cherry turnovers. I just made these exactly by your recipe, they turned out great! Can I send a pic? The only change was I rinsed all the yucky pie mix out and just used the cherries from the strainer and some real cherries I had in the fridge mixed with sugar, same thing (I don’t know what is in that gel). Anyways, mine baked just like you said, with milk and sugar brushed on top for 15 minutes at 375, perfect. I drizzeled or globbed the frosting cream cheese sugar on top and they are crunchy and soft and so perfect, thank you so much! I would love to see a photo of how yours turned out! I bet they were fantastic with the fresh cherries! I hate to give a bad review but I have made these 3 times now and every time barely any of them stay together on top, they come unfolded and look hideous, always really disappointed after my high hopes of them turning out as cute as the picture. First, I tried just like it said only pinching them together, nope fell apart. Then, I tried getting them just a little wet with water, nope fell apart. Last, I just made them and did a little egg as glue, nope all opening up and look like poo. I give up, not making them again. Can you substitute Hershey’s kisses for the fruit. I’m making these tonight. I will post how it turns out. Cute, easy, tasty ! Thank you for sharing. OMG! What did I do wrong!? These were awful! Very dry! Is puff pastry the same as phyllo dough? I unrolled the dough was I suppose to use one sheet? I need “Cooking 4 Dummies”! Oh dang. Puff pastry is NOT the same thing as phyllo dough! Puff pastry has layers of thin dough and butter, phyllo dough is just the paper thin sheets of dough. No wonder they were dry. If you use the puff pastry, it will be much easier, and they will taste amazing, promise! In the oven right now. A little harder than I thought. Dough dries out soooooo fast! I couldn’t get them to stay together. Put them in cupcake pans. Will let you know how they turn out. These look delicious!! 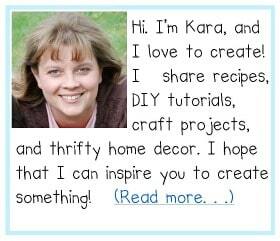 Thanks for sharing 😉 Pinning! They are divine. In fact, I’m wishing I had one (or three) right about now! I haven’t ever made turnovers before either, you’ve done a great job at convincing me to give ’em a try! They look amazing in your photo! Oh Janet, you’ve gotta try ’em! I couldn’t believe something so easy could taste so good! Ya know how you start to trust a cook because you’ve tried enough recipes to know they aren’t gonna jack you with a nasty one? That’s how I feel about you. :). pinned!